Kale is a member of the cabbage family. It’s center leaves do not form a head as is the case with headed cabbages. Kale plants can have green or purple leaves and come in two varieties: kale (which has smooth leaves) and curly kale (which has crinkly leaves). From a nutrition point of view, kale is composed out of 84% water. It is a rich source of vitamin A and also contains a good amount of calcium. There are a number of sources which advice not to feed kale to rabbits because of it’s high level of oxalates. Oxalate occurs in many plants, where it is a waste product of the incomplete oxidation of carbohydrates. If a rabbit consumes large amounts of oxalates then this could contribute to bladder sludge or other health issues. It looks however that above information is contradicted by one of the most reliable sources on rabbit feeding that actually mentions kale as a leafy green low on oxalates. 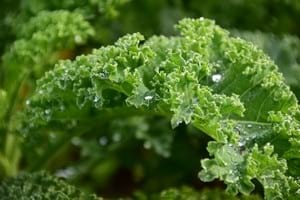 In addition, there is a database of foods analyzed for oxalate content maintained by the Harvard School of Public Health which classifies kale as very low on oxalates. Based on the above we see no reason to exclude kale from a rabbit’s diet. So if you are looking for a new leafy green or if you have already been feeding kale then there is no reason to be worried. Just make sure to rotate with other greens on a regular basis and pay attention to how your bun behaves. Conclusion: there is a bit of contradicting information on whether rabbits can eat kale. Based on what we have found there currently seems to be no harm in feeding kale. Do you offer your bunny kale? Let’s us know your thoughts.